Dillon Gage Inc. of Dallas (www.DillonGage.com), founded in 1976, companies include: Dillon Gage Metals one of the world's largest precious metals wholesale trading firms. The firm is an authorized purchaser for all major world mints and maintains inventory in over 20 countries around the world. FizTrade Online Trading (www.FizTrade.com) offers real-time bid/ask trading platform for gold, silver, platinum and palladium, Digital Metals delivers advanced tools and technologies that enable market participants to be more successful in their businesses. Digital Metals offers cloud-based solutions for the physical precious metals marketplace built upon the Digital Metals Platform. Dillon Gage Refining is comprised of professional assayers and refiners of precious metal scrap, from low grade to karat scrap. Stone removal services and diamond experts on staff. 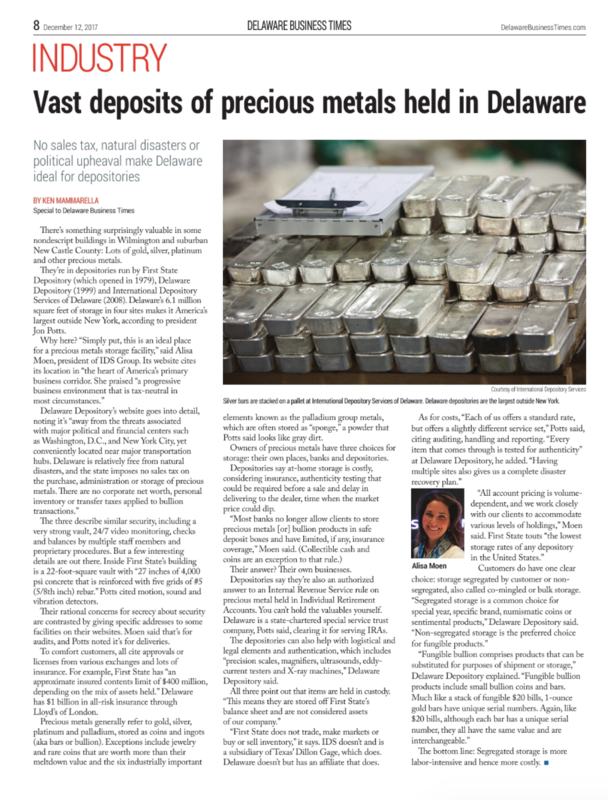 International Depository Services Group with locations in Delaware, and Ontario, Canada and offers secure, efficient and insured precious metals and certified coin depositories that focus of custom business logistics solutions which include storage, fulfillment, inventory managements and many other value added services. Gold Cliffhanger: Will the Metal Move if There is a Fed Hike Reprieve? What happens to the North Korea Summit Coin? What's Behind Those Shiny Olympic Medals? What is the True Definition of Junk Silver? Gold Prices Lose Luster: Is the Recent Run-Up In Prices Over? Gold Sales Heat Up in Europe After Trump Win, But Not in the U.S.
What Moves the Needle When it Comes to Precious Metals Spot Prices? Do Commodities Belong in Your Portfolio? Want to get real-time gold and silver spot prices on your TV? Investors Gold Rush Spurs Fears Of Bubble: Buy Now Or Sell? Reinventing The American Dream, Abroad! Dodd-Frank Rules Outlaw Retail Gold, Silver Trading? Hey, What’s That Olympic Gold Medal Worth, Anyway?